This green facade made of climbing plants helps to cool the building and blend it into the heritage garden surrounds. 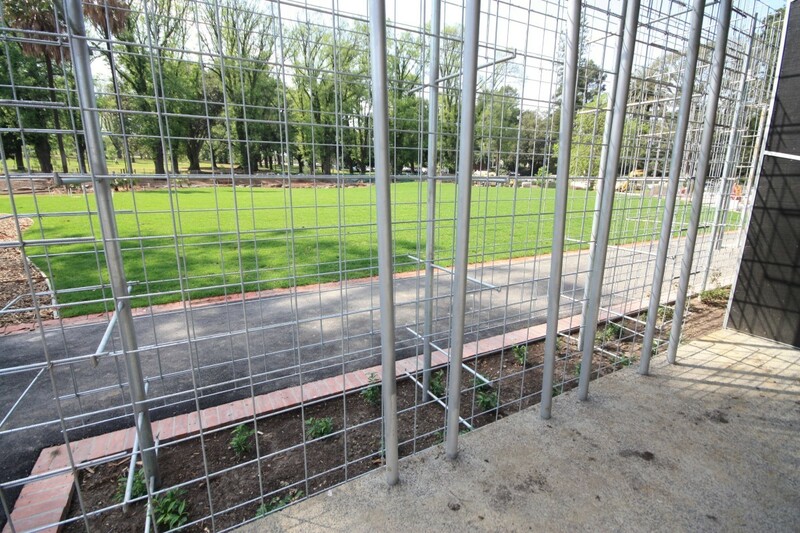 A redevelopment project in Fitzroy Gardens in 2013 and 2014 included the installation of an underground stormwater harvesting system, a new visitor interpretation centre, café and a garden area. As part of the design, we installed a green façade on the visitor centre. This helped it to blend in with its heritage surrounds. It also helped to demonstrate that, through design and function, all buildings could reduce their impact on the environment. The green facade comprises a selection of climbers, interspersed with window openings. These function as a shading device for the building’s eastern façade and the southern deck. Combined with misting sprays set within the wall, this will pre-cool the outside air before it is drawn into the building through the window and doors. The green façade is structured on an open steel mesh frame. 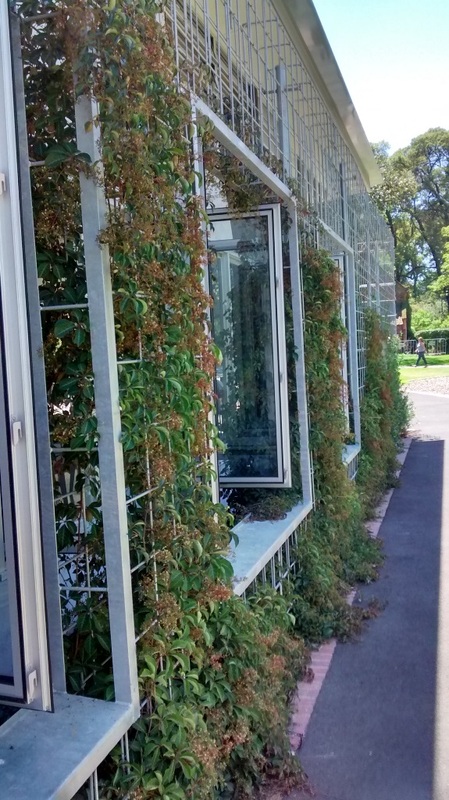 A variety of deciduous and evergreen creepers grow on this frame. The deciduous plantings allow sunlight into the building during winter months. What benefits has the green facade provided? 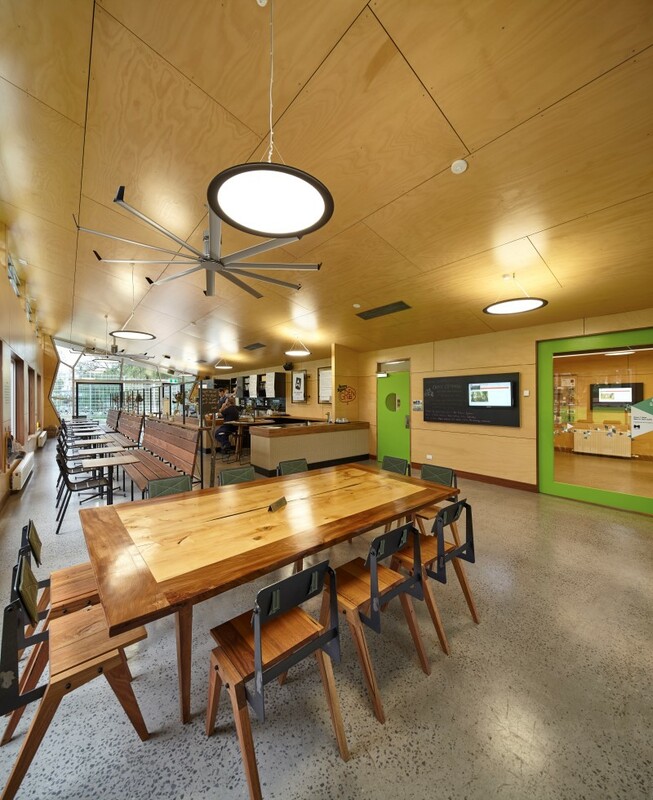 Reduced energy expenditure and carbon emissions at the visitor centre. A public demonstration of best practice green façade design. 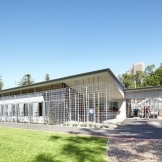 The facade component of the visitor centre cost $20,000. It was a subset of a larger Urban Water hub project. Covering a screen with a layer of vegetation shades the building’s wall. This stops it from absorbing heat and reduces the wall surface temperature. Studies on green facades show that decreases in wall surface temperature of 5 – 10°C are common. Vegetation provides cooling effects, as plants take water in through their roots and it transpire through the leaves. Energy from the sun that would otherwise heat the wall surface and increase ambient air temperatures is instead used in the evapotranspiration process, resulting in latent heat loss that lowers the air temperature. When there is a gap between the wall and the facade, hot air moves up through the space between the wall and the vegetation, providing passive cooling. Construction of the green facade took place between June and December, 2014. The total cost of the façade was $20,000. The City of Melbourne and the Victorian Government each contributed $10,000. The cost of the green façade is considered to be an investment in environmentally sensitive design that will pay for itself with energy and water savings. 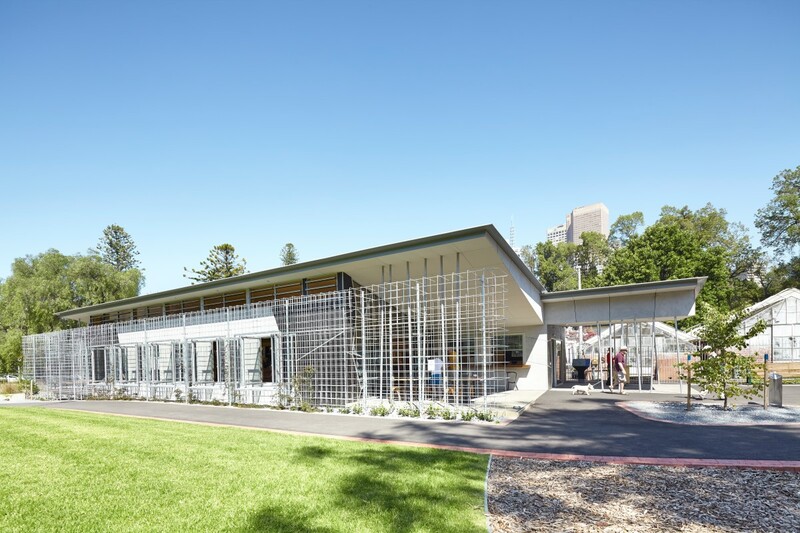 By shielding the visitor centre, the façade improves the visual amenity of an important Melbourne park. It also provides an example of how plants can be used to improve the microclimate around buildings. We promote the development of facades on private property, so it is important to showcase examples on council-owned buildings. Fitzroy Gardens is a heritage landscape. 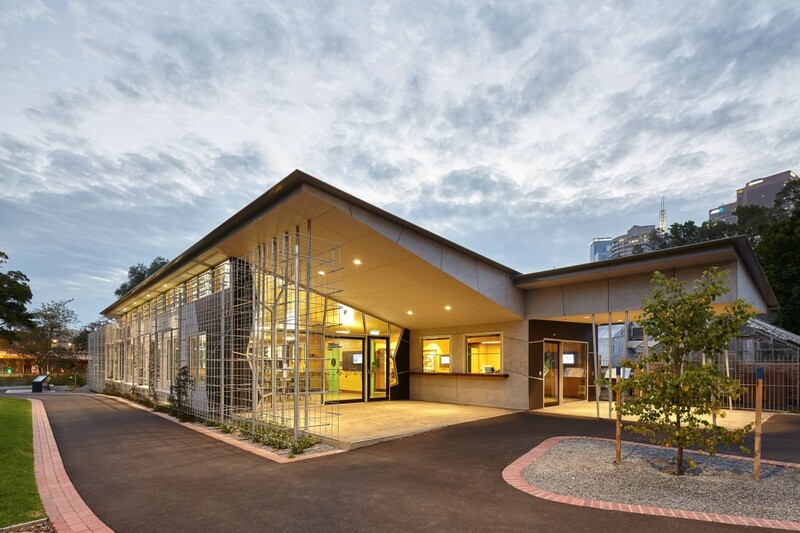 Creating a new building that respected this heritage was a key focus in the design process. The green façade design helped the modern building blend into the landscape. As a contemporary public building, it is important that the visitor centre provides an excellent example of sustainable design. In addition to helping the building blend into its green surroundings, the green façade was designed to cool the building in summer and allow sun to warm it in winter. We have helped develop the Growing Green Guide, Australia’s first ‘how to’ guide for green roofs, walls and facades. The green façade demonstrates best practice in using green façade technology to improve the thermal performance and aesthetic value of a building. Electric heating and cooling systems are not needed at the visitor centre because there are passive temperature control measures instead. The cooling system consists of a rock store beneath the floor that retains cool temperatures, natural ventilation through open windows and fans, and the green façade, which cools the exterior. For heating, a small gas-fired boiler provides very efficient heating via wall-mounted panels. The windows have been located so as to maximise natural light and reduce the need for electrical lighting. High efficiency LED light fittings are used throughout. Rainwater is collected from the roof of the centre and stored in tanks to be used for toilet flushing. This can be supplemented with water from the stormwater harvesting system beneath the visitor centre. The green façade is simple system. It consists of a metal frame, installed in the ground, wrapping around the outside of the visitor centre’s walls. 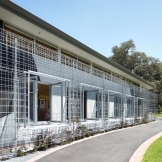 The frame is made from round metal bars about 10 mm thick and set in a wide hatched pattern. It sits about 1200 mm away from the wall. The frame sits within a garden bed that has been planted with a range of climbing plants. These plants will grow to cover the frame and hide it from view. The façade frame has been designed with two layers, so looking at it from above it would be a square shape rather than a flat line. 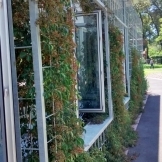 This allows two layers of climbing plants, increasing the shade cover and cooling that the façade provides. Four different types of climbing plants were used on the green façade. These are twining climbers, meaning they wrap around the metal bars of the frame as they grow. A mixture of deciduous and evergreen species was used; so more sunlight filters through in winter. The variation in foliage will also provide visual interest. We used: Vitis vinefera ‘Purpurea,’ Trachelospernum jasminoides, Parthenocissus henryana. The climbers were installed as 140 mm pot stock and trained onto the bottom of the façade frame using temporary bamboo supports. For rapid coverage of a green facade, plant specimens should be healthy and vigorous, with numerous basal shoots. They should be of the largest possible size to suit the installation. It is essential to prune and train new plants to promote the development of an effective facade. 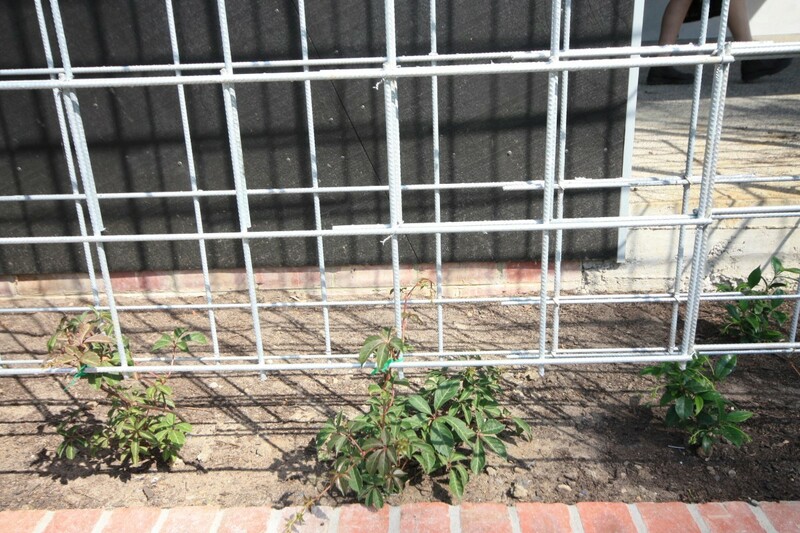 We trained the plants to grow up onto the frame using temporary bamboo supports. Once the plant is established, the main runners should be trimmed to encourage lateral shoots that will create a more radial growth pattern. Otherwise the plants will only branch out once they have reached a significant height. It may take years for the lower portions of the facade to receive any coverage. For long-term installations, pruning to rejuvenate might be required. As climbers age their growth can decrease and cutting back to hard wood can revitalise a plant. It may be necessary to prune back a large portion of foliage after five to seven years. 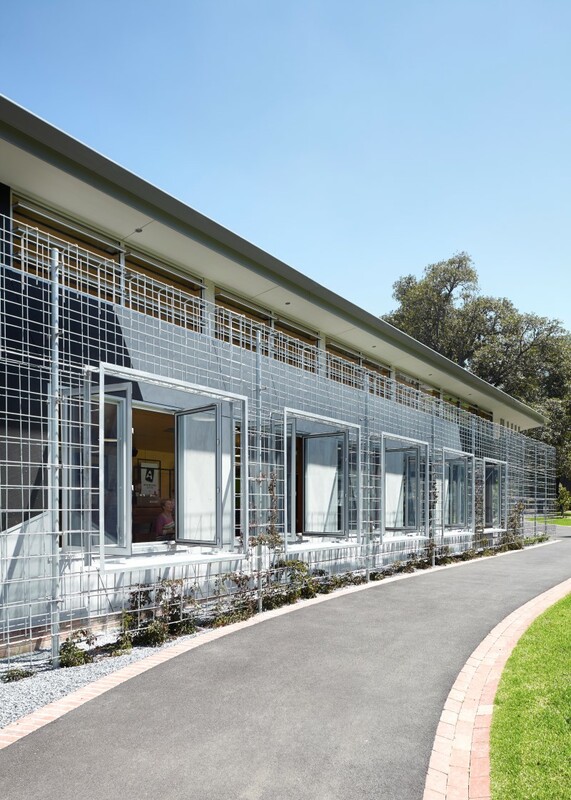 To read more about green facades, head to the Growing Green Guide website. The space between the wall and the green façade is important because it enhances the cooling capacity of the green façade. The plants shade the external wall of the visitor centre and the air gap allows for ventilation. This creates a layer of cool, shaded air around the visitor centre and prevents it from heating excessively during summer. On hot days, Melbourne’s urban area can be up to four degrees hotter than surrounding areas, as a result of the urban heat island effect. The Growing Green Guide provides all the information you need to know about green roofs, walls and facades. The water cycle is the movement of water around the earth.